Selecting edit in the main actions menu, lets you edit an existing lecture. 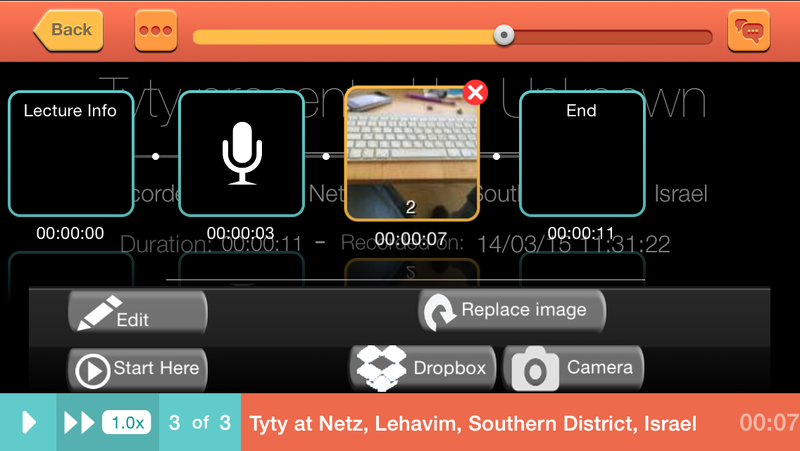 Edit – allows you to reposition capture areas. Select the thumbnail of the image you wish to edit, it will go to the edit screen for that image. When you are done editing you can apply your changes only to the current image you are editing, or apply to all images to the end of the lecture. Useful if you didn’t set up the phone exactly right when recording, or the phone was moved while recording. Start here – allows you to change the start position for playback – useful if you started recording before the class started. Replace image – select the thumbnail of the image that you wish to replace. Replace image will let you select an image from your image roll, inserting it as a replacement for the selected image. When done you will be able to edit the capture locations for the new image. Dropbox – same as replace image, but you can select the image from your Dropbox. It works only if you select actual image files – .jpg or .png files. Camera – like Dropbox, but uses the camera to take an image to replace the image you selected. This entry was posted in 1. Using LectureMonkey, Blog, Editing. Bookmark the permalink.